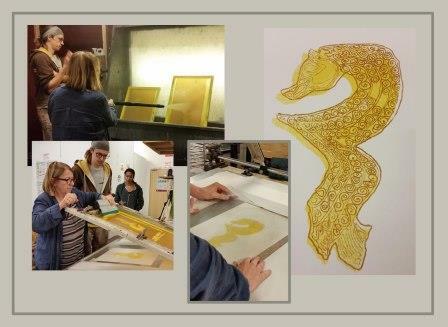 On Saturday 21 October Isobelle and Monica spent the day screenprinting at the Printhaus in Cardiff. They had a wonderful time learning from a great tutor who skillfully led the through the process with good outcomes. Isobelle focused on an image of the Staffordshire Hoard that she is planning to use for a piece of textile art work that is in the making. Monica chose to create an orchid image on paper and fabric…. A very worthwhile day – and thinking about a return visit in the not too distant future! A Sew Happy Sewing Day!